All Saints' is the home to Kauai's only remaining "true" pipe organ. This pipe organ is a unique feature of All Saints' Church and an integral and popular part of our worship. Unfortunately age and the environment have taken their toll on the wood, metal and leather parts of the mechanism with the result that minor repairs are becoming a routine necessity and maintenance costs are rising. Many of the repairs have been "stop gap" measures which enable us to continue to use the organ but do not resolve the underlying major problems. Now it is in great need of rebuilding and updating. 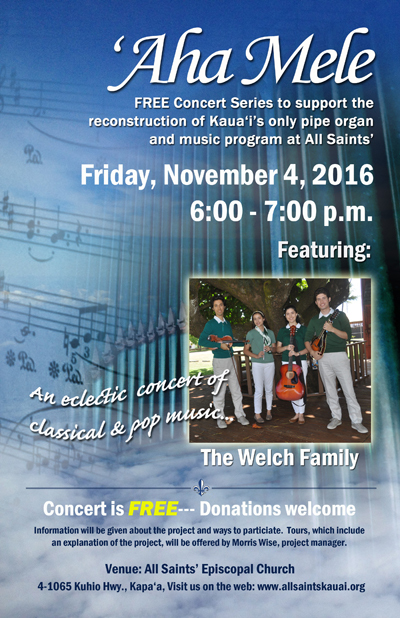 'Aha Mele, a benefit concert series, is a fundraising effort to raise the nearly $150K needed for the reconstruction of the organ and replacement of the console. The concerts will feature local and special guest musicians who have agreed to dedicate their time and talent towards this effort. The goal of this organ project is to preserve and build upon the musical legacy of its original benefactor, Mrs. S. W. Wilcox. We hope to enhance our music program that will not only provide a venue for concerts in the community, but to raise awareness and encourage the talents of future organists for generations to come through a program of internships for visiting students. The organ is an Austin Organ Company "Chorophone unit organ" Opus 1351. The original contract was signed April 25, 1925 and the organ was finished at the factory by October, 1925. The original cost was $3,400.00 and installation was completed by Ernst Gieseke. The organ is free-standing, is encased in a birch case and has four ranks (Diapason, Bourdon/Harmonic Flute, Viole and Dulciana). The organ's pipe work was is organ was amended in 1982-1983 by Terrance Schoenstein. All of the pipes in the organ were replaced at that time except for the lowest pedal notes of the Bourdon 16’. The new pipes included a Spire Flute and it’s mate a Spire Flute Celeste, a new Principal (in place of the Diapason) and a 3 rank mixture. Under the new scheme the organ has 6 ranks of pipes and reflected 1980’s interest baroque music and a different approach to the sound of the organ. An ecletic concert of classical and pop music. 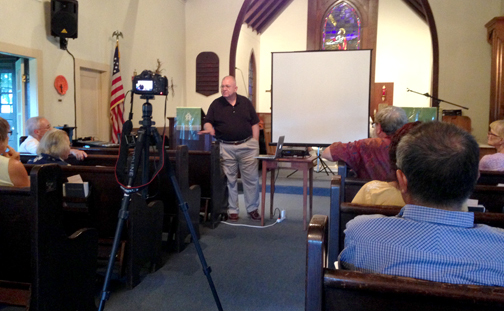 On Wednesday evening, October 15, All Saints' welcomed renown organ builder and expert, Manuel Rosales, of Rosales Organ Builders, Inc. in Los Angeles, for an informational gathering to discuss the future of the pipe organ. Morris Wise, who has been actively involved in the rebuilding effort of the organ, was also on hand, and those in attendance included Vestry members and several interested church members. After examining the organ, Rosales shared his findings and explained the different options available for rebuilding Kauai's only pipe organ. The project involves reusing parts of the current organ (about 20%-30%) and replacing the remaining parts with new and/or refurbished parts. Rebuilding the organ would significantly improve the sound of the organ, offer additional instrument sounds, provide a state-of-the-art technology backbone to the organ, and allow us to reduce the size and footprint of the organ console. The preliminary cost projection for the rebuilt organ is between $150K - $200K and the project would take an estimated 18 months. Mahalo to everyone for making the first 'Aha Mele Concert on June 8, 2014, such a success! Special thanks to organ expert Morris Wise and to musicians Paul Togioka and the Ali'i Strings for dedicating their time and talent to this effort! We are deeply grateful!!! DONATIONS WELCOME! If you would like to make a donation towards the organ fund, you may mail in a check payable to All Saints' Church, P. O. Box 248, Kapa'a, HI 96746. Please make a notation in the memo portion "Organ Fund". Mahalo!